New accessories and artwork make a South End living room feel welcoming. 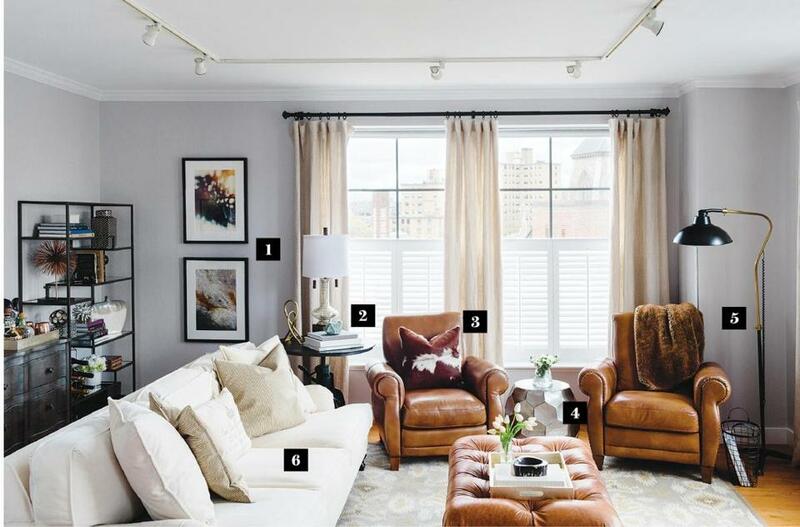 Although the owner of this one-bedroom condo in the SoWa neighborhood of Boston had all the basic furnishings — leather club chairs, tufted ottoman, roll-arm sofa— the space just didn’t feel like home. Referred by a friend to South Boston-based interior designer Caroline Hughes, the homeowner, a thirtysomething lawyer who spends a lot of time at the office, asked that Hughes make it look like someone actually lives there. “She loves having people over, so she wanted the space to be warm and inviting,” Hughes says. For one thing, the room needed artwork and accessories. Using the rich caramel of the leather pieces as a starting point, Hughes layered in metallics for drama and shine. Floating the sofa in the space, she freed the back wall for a stylish vignette that serves as both a focal point and functional storage space. The result is a room that looks lived in but works well for entertaining, too. 1. Hughes elevated inexpensive prints purchased online from Minted in custom black iron frames from A Street Frames. “The subject matter — an abstract sky and trees and a detail of a stone slab — play off each other and offer a nice juxtaposition to the urban landscape out the window,” Hughes says. 2. A higher than usual side table and lamp add height to the room, helping to bring the eye up toward the city view. 3. Hughes accented the armchairs with a hide pillow and faux fur throw. “The homeowner is more drawn to texture than pattern, so we incorporated accessories in a variety of materials for interest,” Hughes says. 4. A shorter honeycomb side table from Home Decorators Collection has a distressed metallic finish that glows in the sunlight. 5. An adjustable floor lamp from Pottery Barn augments existing track lighting. Its black finish echoes that of the curtain rod, picture frames, and shelving. 7. “Storage solutions are good styling opportunities,” Hughes says. 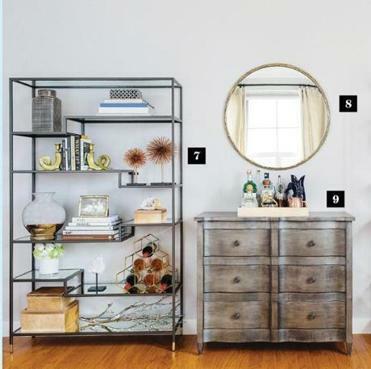 On the wall behind the sofa, a Tiered Tower bookcase (one of a pair flanking the chest) from West Elm holds photo boxes and wine bottles as well as decorative pieces. 8. A mirror with a molten brass frame from CB2 bounces light around the room. 9. The Wynn chest from Ethan Allen provides storage for linens and a place to set up a home bar. “The wavy, more feminine silhouette is a nice contrast to the streamlined shelving,” Hughes says.